This was great! I made two of them, one for New Year's Eve, & and one for New Year's Day. They were big hits on both occasions. I liked it because the ingredients were simple & basic, & the directions were specific & clear. I found that the advice regarding melting the sugar was very helpful (I have burnt sugar before when I didn't pay close attention). Everything came off without a hitch, except that I tried it in a blender the first time, but it was too full & ended up messy when I tried to pour it. So, the second time, I just used a regular mixer & bowl & it was fine. I also put the finished flan into the refrigerator overnight, so that it would set a little more & be cold when served. Spray an angel food cake pan with cooking spray. Pour the caramel sauce evenly over the bottom of the pan. In a medium bowl combine the flour, cocoa, cinnamon, baking soda, salt and mix; set aside. In a microwave safe bowl and the chocolate and butter and microwave in 30 seconds intervals until chocolate is melted and it's smooth. Mine took about 1 minute and 30 seconds. Add buttermilk, sugar, eggs and vanilla to the melted chocolate and whisk until it's smooth. Pour chocolate mixture to the dry ingredients and whisk until it well incorporated and smooth. Pour the chocolate batter evenly over the caramel in the angel food cake pan. To make the flan simply add all the flan ingredients to a blender and process on low until smooth. Be careful, there's a lot of batter here, so you want to make sure you do this on low otherwise it might explode all over. Pour the flan batter over the chocolate in the pan. Place the cake pan in a large roasting pan and place it in the oven. Add enough hot water to the roasting pan to reach halfway up the sides of the pan. Careful so you don't burn yourself. Bake the cake for about 1 hour and 30 minutes, mine took about 1 hour and 40 minutes, or until you insert a toothpick in the cake and it comes out clean. Cool the cake completely in the pan and refrigerate it overnight. 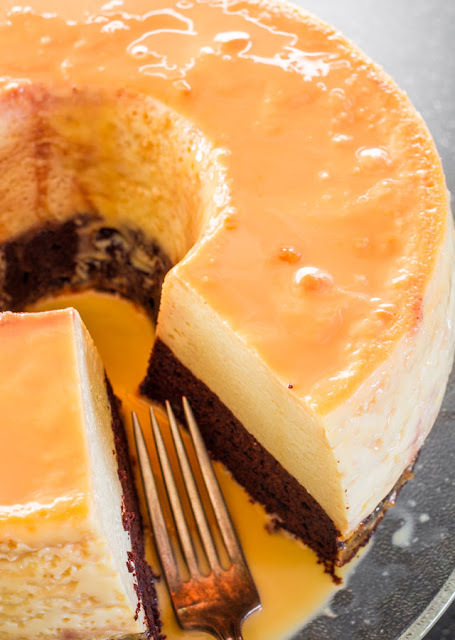 Next day, fill the roasting pan with water, or your sink and place the bottom of the cake pan in the water to warm the caramel and the flan portion of the cake. You only need to do this for a couple minutes. Carefully turn the cake onto a large serving platter or cake stand.